With all that a handyman can do, a constant need for their services exists. Since each request differs, a system that quickly allows your dispatchers to take down client information and relay it to your team works wonders. The solution? Smart Service, a handyman dispatch software that syncs job details and scheduling to the billing information already in QuickBooks. This software creates an intricate web between your clientele, dispatchers in the office, and workers out in the field. Full access to job and client information, along with a streamlined system of communication, allows for maximum efficiency, making your business more profitable! Our handyman dispatch software will help eliminate the time wasted by scrambling for files, checking around breathlessly for schedule openings, and unnecessary back-and-forth communication between the office and field technicians. This dispatch software will sync every part of your company into one organized system. You will schedule work requests in real-time, send out work orders instantly, and communicate with your handyman workers out in the field. By maximizing time in all these areas, your dispatchers will have increased availability to field more client work requests and improve your overall bottom line. 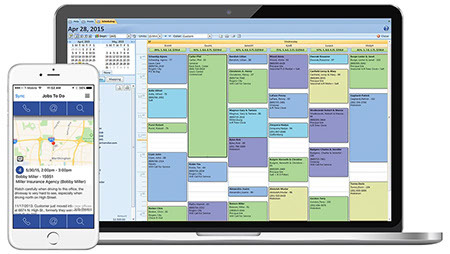 Handyman dispatch software allows you to streamline scheduling and billing into one integrated system. Smart Service is a QuickBooks add-on that provides additional features beyond accounting. With these features, your handyman business can build a thorough, comprehensive customer database so that no questions go unanswered. Dispatchers can easily pull up a customer’s profile to review completed work from the past, previous notes from those jobs, contact information, and billing information. While on the phone with a potential customer, the last thing you want to do is put them on hold while you pull their file. Multitasking becomes a reality with handyman business software, as your dispatchers can get all the information they need in a few clicks. No more waiting on hold and no more muddling through paperwork. Your dispatchers will have all the resources they need in one single place to give your clients, field workers, and managers immediate answers and solutions. Another advantage of Smart Service rests in its ability to generate cost estimates and proposals. Whether dealing with a new or existing prospect, you want to respond as quickly as possible. If job estimates get delayed, your company could lose business to its competitors. Your clients request your services because they either cannot do the work themselves or the job requires immediate attention. With handyman estimate software, your dispatchers will have the power to immediately assign the most qualified field technician to the site to evaluate the potential job. With the mobile iFleet app, your handyman can generate a work estimate right at the site and relay it back to the office. Within hours of this transfer, or even minutes, your dispatcher can call the prospect back to put your company in the best position to win their business. Integrate your company data and maximize efficiency with our handyman business software! Request a demo now to see how Smart Service can improve the profitability of your handyman business! Handy tips for handy professionals!